I’m still not sure how Disney’s Atlantis: The Lost Empire missed its audience when it hit theaters in the summer of 2001. While it didn’t exactly bomb, its $84 million domestic box office haul wasn’t too impressive by the studio’s standards. Atlantis came out right smack dab in the middle of computer animation’s emergence as the dominant form. Maybe kids already saw traditional animation as passé when compared to the likes of Toy Story (1 and 2) and A Bug’s Life. Of course, Atlantis contains a significant amount of CGI, but it isn’t fully CG like those early Pixar features. The lack of girly-ness might have also contributed to the overall indifference (much more action-heavy, less princess-oriented). Initial reception aside, Atlantis: The Lost Empire is a spectacular entertainment that stands as one of the more enjoyable Disney animated features. Admittedly the film is largely missing the overt sentimentality of many of their other films. If it needs to make up for that, it does so in terms of excitement. Set in 1914, the story centers on gawky adventurer Milo Thatch and his attempts to discover the legendary lost city of Atlantis. In a prologue set some ten millennia in the past, we see Atlantis nearly destroyed by a catastrophic tsunami. Once underway, Milo and the crew of a submarine named Ulysses discover the city and its inhabitants, including Kida (Princess of Atlantis) and her father, King Kashekim Nedakh. Perhaps the narrative doesn’t flow as smoothly as it could’ve and Commander Rourke, head mercenary accompanying Milo on the mission, turns out to be a double-crossing, clichéd villain. His desire to exploit the secrets of Atlantis for commercial gain isn’t the most imaginative plot device. On the other hand, the pulpy plot twists suit the action-oriented material quite well. Not a fairy tale or retelling of a timeless fable, Atlantis is a sci-fi/fantasy adventure. The production design by comic book artist and writer Mike Mignola (one of several production designers on Atlantis) is quite distinctive among the Disney catalogue. It really does look like a graphic novel has sprung to life on screen, bearing the heavy influence of Mignola’s work (the best known of which being Hellboy). Michael J. Fox voices Milo and the actor had only recently gone public with his Parkinson’s disease. Some felt the promotional campaign should’ve exploited his affliction (i.e. “Look folks, he can still play a hero!”), but I think that would’ve been tacky. The fact is you’d never know Fox was suffering any problems and I imagine such an approach would’ve backfired on Disney. As it is, Fox’s work is just a little too “gee-willikers” earnest for my taste. A little more subtlety would’ve gone a long way, but it’s a decent bit of voice acting for the most part. James Garner is appropriately gruff as Rourke, John Mahoney is loopy as Preston Whitmore (the rich guy who funds the expedition), and Leonard Nimoy instills King Nedakh with the right amount of regality. 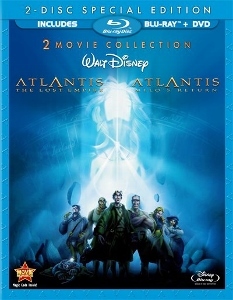 This “two-movie collection” also contains the direct-to-video turkey Atlantis: Milo’s Return. 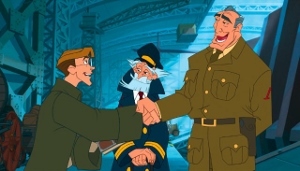 There was originally to be an animated series called Team Atlantis which was wisely canned. Unfortunately, Disney decided to salvage the only three episodes produced by editing them together and issuing it on DVD in 2003 as Milo’s Return. To call it an embarrassment is an understatement. Much of the original voice cast returned, but James Arnold Taylor gamely attempts to impersonate Michael J. Fox in the title role. The animation lies somewhere below the bottom of the Disney barrel; it would’ve looked crummy as a Saturday morning TV show 20 years earlier. The less said the better (very young kids may get a kick out of seeing the characters again). No real complaints on the 1080p transfers of Atlantis. The aqua-tinted film plays out mostly in various stages of low-lighting. Black levels are deep and solid. The 2.35:1 aspect ratio, a rarity for Disney animation, helps contribute to the epic, cinematic feel of the film. The “sequel” looks fine too, inasmuch as it’s a good transfer of an unattractive film. Both films received lossless DTS-HD MA 5.1 surround mixes. Again, the original film sounds terrific, with James Newton Howard’s score filling out the spectrum majestically. The action set pieces make good use of the surrounds. The 5.1 treatment is clearly overkill for Return, but it’s nice to have it (if we’re going to have it at all). Here’s the one small catch: not all of the vast special features from the Atlantis: The Lost Empire two-disc special edition DVD are carried over here. There are, at least, more included than on the other recent Disney twofers (Emperor’s New Groove and Lilo & Stitch lost the majority of theirs, plus had them relegated to the included DVDs only). There’s an hours’ worth of “making of” material, some deleted scenes, and a couple of kid-oriented features (“How to Speak Atlantean” and “Atlantis: Fact or Fiction”). One mercifully brief deleted scene is included for Milo’s Return. While it seems like a missed opportunity to make this a truly definition release, Atlantis: The Lost Empire looks and sounds great on Blu-ray, making this a must-own for collectors. The three-disc set includes each film on standard DVD.